You are here: Home / Family / Back to School with Metro Grocery: Tips and Tortilla Sushi Recipe! We are into the 3rd week of back to school and getting back into routines with the kids, our schedules and making it work. It’s still a busy time of the year for moms and dads and transitioning can be a feat, no matter how prepared you may be! I think one of my biggest challenges (besides the early mornings) is finding exciting and delicious recipes to offer my little gastronome. Metro grocery had teamed up with Donna Dooher Food Network chef, cookbook author, restaurateur and mom to offer a list of tips and recipes to help make the transition from summer to back to school routines seamlessly. Below you will be able to win an amazing gift basket full of goodies valued at $100, sponsored by Lucy’s Market gift baskets! Think about how much your child usually eats and keep that in mind when making their lunches. This will help them to avoid wasting or overeating. 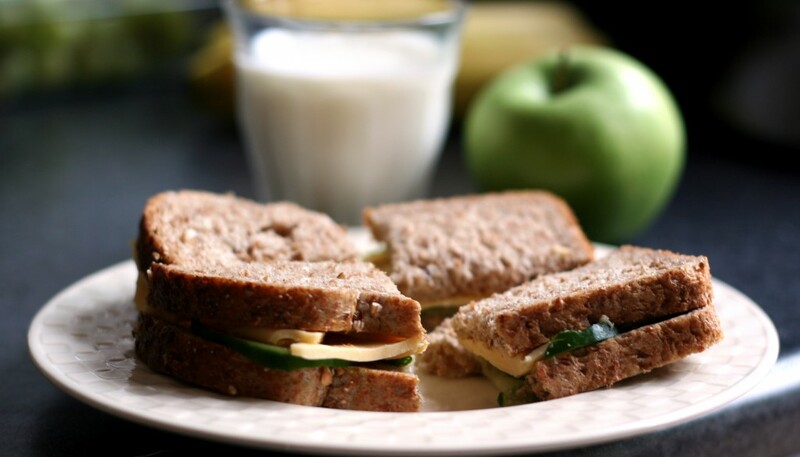 When making your kids’ lunch, try the Irresistibles Life Smart loaves or bagels. Not only do they help with portion control, they are packed with beta-glucan, which is proven to reduce cholesterol and boost the immune system! If your kids are picky and don’t take to fresh produce, have them help you pick out their favorites at the grocery store. Eating an apple is much more fun when you’ve picked it out! Aside from having the nutritious fruits and veggies, throw in a small treat. Even if they eat it first, it’ll be incentive to finish the rest! Having something to dip fruit and veggies in always makes it more fun and delicious to eat! Hummus, spinach and roasted red pepper dips are delicious options. You can even dip whole wheat bread and crackers! Try to implement protein like chickpeas and lentils as a compliment to the dish instead of the main ingredient to ensure a balanced diet that young taste buds will love! Tips for Preparing Affordable Lunches! When shopping for lunch snacks like yogurt or cottage cheese, buying the large container and dividing it into reusable containers each day will be friendly to your wallet and our environment. An easy way to cut down the grocery bill is to opt for private label brands carried at your grocer. For Metro consider Irresistibles or Selection. You won’t have to sacrifice taste or quality but you’ll notice the difference at the cash register and your wallet! To save money and make lunches while on a time crunch focus on nutrient dense foods high in fiber. Simple fresh ingredients always taste the best and are the healthiest! Tips for When You’re Tight on Time! If you’ve got a busy week ahead, take some time on Sunday evening to chop veggies and fruits so they are ready to divvy up into reusable containers in the mornings when the family is in a rush. Organize a group of parents together once a month or even start a group email newsletter to swap ideas and tips. Your kids are more likely to eat their lunch and not swap it when all their friends are also eating something similar. When they help make their own lunches not only provides them with an understanding of what goes into a well-balanced meal, it provides you with an extra set of hands in the kitchen to help speed up the process! Tips for Non-Boring Lunches Filled with Variety! 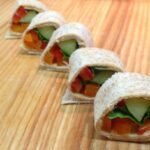 If your kiddos are tired of traditional sandwiches, try swapping out sliced bread for Irresistibles Life Smart bagels, tortillas, raisin bread or pita pockets for a new and fresh tantalizing way to change it up. Play with flavours and experiment. Expert Chef Donna Dooher suggests making fruit kabobs, or adding honey to cream cheese and topping with raisins for a tasty cracker spread. Cream cheese or cheese spread on celery is an easy solution to the no peanut butter rule in schools.Give your signature dishes a fun name; when food comes with a story, kids get excited about eating. Think along the lines of toast soldiers or ants on a log. Metro knows how hard it can be to come up with dinner options for your picky eaters. By mixing up dinner leftovers into creative lunch options you can save on waste and provide a different lunch every day of the week. Donna Dooher suggests transforming chicken breast and boiled potatoes into a chicken Caesar wrap with tasty hash browns for a lunch your kids will crave. This is an incredibly versatile technique. You can use whole wheat, flour tortillas or a gluten-free option. The sky’s the limit on the fillings; chopped leftover chicken mixed with tzatziki can be added and you can substitute the hummus with baba ghanoush or your kids’ favourite spread or dip. Lay tortillas flat and spread evenly with hummus. Place the vegetables down half the tortilla. Sprinkle chopped spinach over the vegetables. Do you like easy recipes? Previous Post: « Make Your Own Nickelodeon Dora the Explorer Digi-Book with Walmart’s Dora Apparel! My kids are SUPER picky.. so they've been getting bagels and cream cheese and some snacks.. not the healthiest but I'm trying to find things they like! I always like to serve up a variety of things..my one go-to for my youngest is homemade healthy lunchables(today she had ham rolls, carrot sticks, coloured goldfish crackers, squirrel shaped cheese, and little panda cookies in it), I also like serving up hot leftovers like pasta or casseroles in their thermos containers…Also homemade muffins or loaves are big here..w zucchini right now! Wraps are always a hit with my kids! Love calling then Sushi! This would be awesome! Wraps are so yummy! You have great ideas and tips here, thanks. My back to school go-to "recipe" is a simple bagel and cream cheese, but I'll need to change things up soon! My favourite is Turkey wraps. Whole wheat wraps, Cream cheese mixed with sage and apple herb blend (epicure), turkey slices, lettuce, and cranberry sauce. Roll it up and cut into slices. Yummy! I don’t have any kids 🙁 I will say though that tortilla sushi looks really good ! Cut up veggies with ranch dip is a favourite with my girls. This year we have started to send homemade frozen smoothies as well. They can't get enough of them. There are so many different combinations of fruit and veggies that can be used to make smoothies, they are certain to not get bored with them! 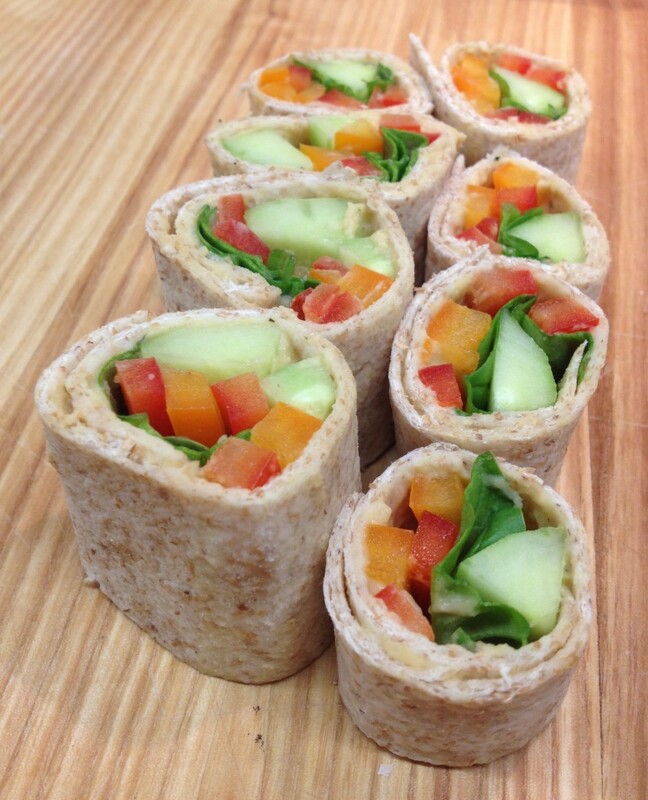 My son loves chicken wraps with veggies and dip! He also loves crackers and cheese! Keilbassa, Cheese and Olives are a fave in our home, but I have to try those tortilla sushi thingies, they look yummy!!!! 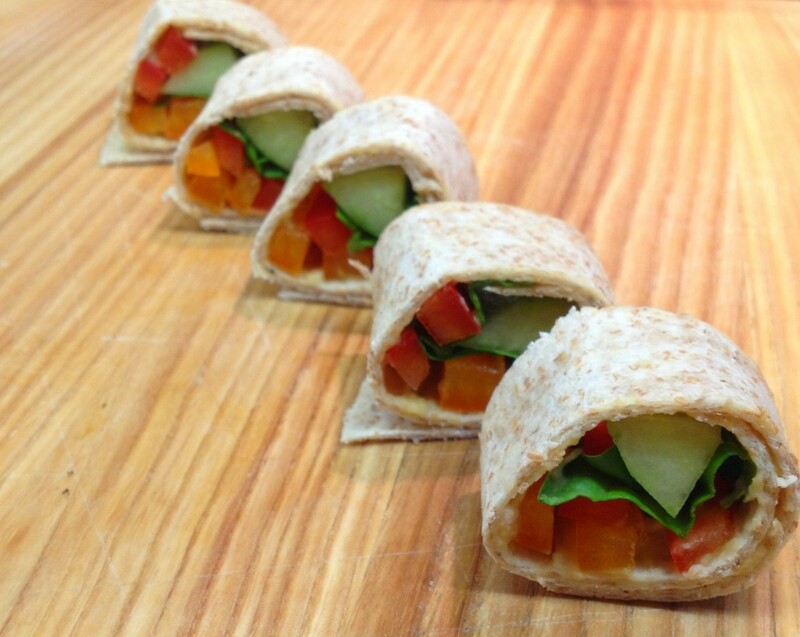 I love wraps for a quick and easy lunch and an alternative to the usual sandwich. My son loves homemade zucchini muffins and fruit salad! I like to transition by trying out new fall recipes and lots of hearty veggie combinations. My kids enjoy mac and cheese in their thermoses, homemade sugar cookies and a super moist sourcream coffee cake . Pretzels are also popular. Our transition was kind of from one extreme to the other…the lazy days of summer to the routine of school….but I think we’re getting more settled now! Stocking up on apples and oranges and other healthy snacks for lunches. My kids are great when it comes to food, they like most things and love being involved. We make sure there are always fruit and veges cut and washed in the fridge, and they help make dips to go along with it.